Like most kids growing in up in a small farming town, I would often complain that there was nothing to do. While we didn’t have many cool spots to hangout, we did have lots of trails, hills, and fields. That led my friends and I to mountain biking. Most people think of a bicycle as an under-age form of transportation; once you reach the magic age of 16 you get your license and there is no need to ride one anymore. For my friends and I, mountain biking became an escape from the pressures of growing up and a way to channel our sense of discovery. As I learned more about mountain bikes and mountain biking, I discovered a principle that not only improved my riding skills, it changed the way I view life. 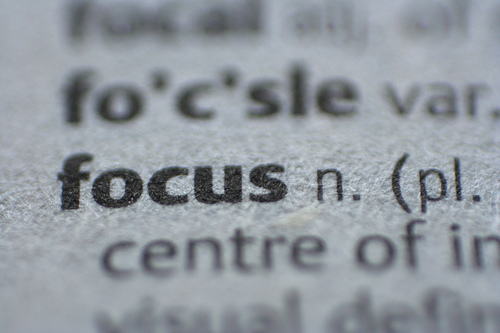 The principle is this: your focus determines your direction. As you ride down a trail on a mountain bike you are bound to come across obstacles like roots, or rocks, or thick mud. The temptation is to focus on these obstacles for fear of crashing into them. The trick is to stay focused on the clear path because wherever your eyes are focused that is the direction you’ll go. This principle is true for life was well: wherever you focus on, that is direction that you will go. If you focus on money, you will make choices based on their financial benefits. If you focus on your family, your choices will be heavily influenced by our family. If your focus is on your own pleasure, our choices will reflect that too. Jesus seems to have lived by this principle when we read what He had to say about his life and ministry. When his fame grew and the people of Capernaum wanted to keep Jesus all to themselves, Jesus said, “I must preach the kingdom of God to the other cities also, for I was sent for this purpose” (Luke 4:43). When the Pharisees criticized him for eating with tax collectors and sinners he explained, I have not come to call the righteous but sinners to repentance” (Luke 5:32). And when James and John wanted destroy a village of Samaritans for rejecting Jesus, he told them, “The Son of Man did not come to destroy men’s lives, but to save them” (Luke 9:56). It is clear from these verses, and others, that Jesus had a focus and a purpose for his ministry. He was able to avoid obstacles and hang-ups by saying, “no,” to distractions and misconceptions and by stating his mission clearly. This leads me to ask some questions: Where is your focus? Are you focused on maintaining an institution or fulfilling a mission? Is your church focused inward on itself or outward on its community? Are you focused on making disciples or just making converts? I don’t know all of the obstacles you will face in the future, but I do know there will be obstacles. The trick is to focus on the clear path ahead and keep pressing on. This entry was posted in Christian life, Revitalization and tagged Christian life. Bookmark the permalink.